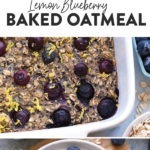 This delicious lemon blueberry baked oatmeal recipe screams spring with the combination of fresh blueberries and lemon zest. 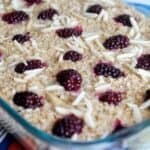 This delicious vegan baked oatmeal is made in under an hour and has 100% whole grains and no refined sugar. We’re v excited to be working with Silk again this year to bring you more healthy, plant-based recipes. I’ve been an almond drinker for longer than I can remember and Silk is my #1. Over the years I think I’ve tried almost every product that Silk offers (that’s millions, btw). Well, not millions, but Silk has products ranging from dark chocolate almond milk to caramel almond creamer to dairy-free yogurt. My favorite? Their classic Unsweetened Almondmilk. You just can’t go wrong. Flavor is number one because I genuinely love the flavor of Silk almond milk. When I’m not baking with it, I’m using it as a cereal topper, in sauces, etc. It really is just the best. 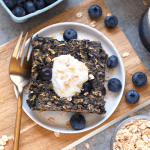 This vegan oatmeal bake is the epitome of spring. 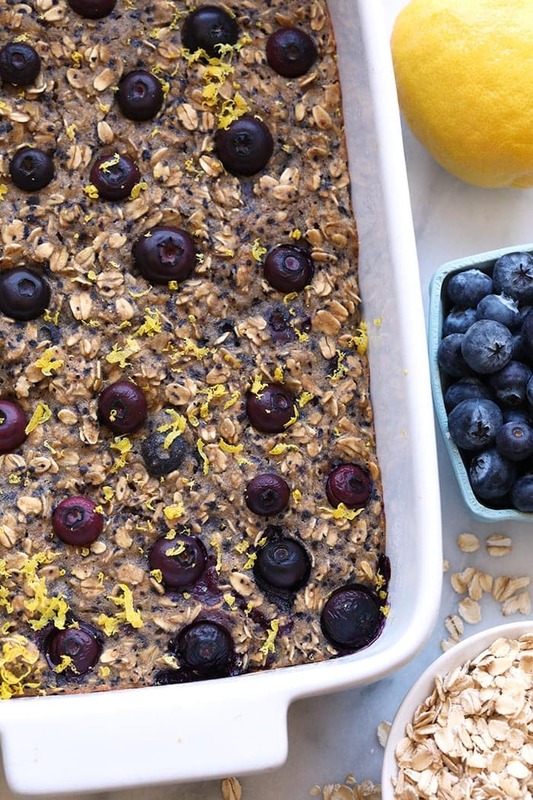 My lemon zest obsession continues with this Lemon Blueberry Vegan Baked Oatmeal recipe. 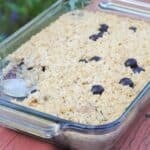 I know you guys love oatmeal bakes because some of FFF’s most popular recipes are baked oatmeal! For example, our Dark Chocolate Berry, Strawberry Rhubarb, and Peanut Butter Banana to name a few. This variation, in particular, is VEGAN. I decided to swap out my normal 2 large eggs for 2 flax eggs and voila, you’ve got yourself a 100% plant-based recipe. The nice thing is, we tested it both ways! If you’re an egg lover, feel free to wap em right in. Preheat oven to 350ºF and spray a 10-inch by 7-inch casserole dish with nonstick cooking spray. Prepare 2 flax eggs by mixing together 2 tablespoons ground flax seeds and 6 tablespoons of warm water. Mix and let sit for 15 minutes or until gelled. Place banana, 1 cup of blueberries, maple syrup, vanilla, and almond milk in a blender or food processor (I used a single serve smoothie cup) and process for about a minute or until everything has pureed. Transfer into a bowl and add rolled oats, white whole wheat flour, baking powder, and a pinch of salt and mix. Then, add in flax eggs and mix again. Finally add in blueberries and lemon zest and mix again. Transfer batter into casserole dish and use a spatula to spread evenly. Add additional blueberries on top. Bake at 350ºF for 30 minutes or until fully cooked. 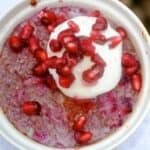 Serve with fresh lemon zest and Greek yogurt. 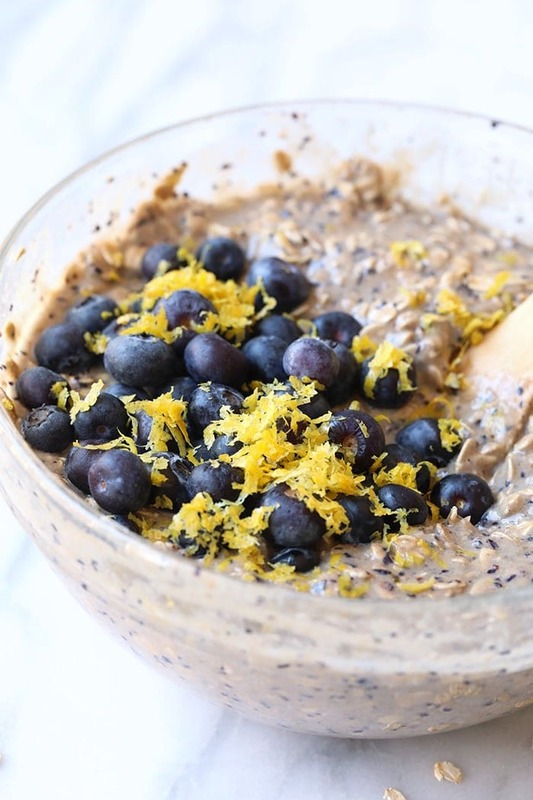 To make 1 flax egg, combine 1 tablespoon ground flax seeds and 3 tablespoons of warm water. Mix and let sit for 15 minutes or until gelled. This post is sponsored by Silk. I was compensated and all opinions are my own. Thank you for supporting Fit Foodie Finds and for making this website possible!